Eucalyptus Tortoise Beetle (Trachymela sloanei), "Sycamore Grove/Veteran's Park"
The two species of tortoise beetles have similar biology and appearance. By comparison, Trachymela sloanei adults are dark brown with blackish mottling, whereas Chrysophtharta m-fuscum adults are lighter colored and gray to reddish brown. Adults of both species are hemispherical (like half a sphere) or rounded, about 1/4 to 3/8 inch long, and superficially resemble a large lady beetle. Two species of eucalyptus leaf beetles from Australia, also called tortoise beetles (family Chrysomelidae), have been introduced into California. Trachymela sloanei was found in 1998 in Riverside County and now occurs throughout most areas of California where eucalyptus trees grow. Chrysophtharta m-fuscum was discovered in Orange County in 2003 and has spread to at least four nearby counties. Female Trachymela sloanei lay 5 to 40 or more eggs side by side on leaves or under loose bark. The eggs are pinkish or light brown at first and become orange or dark brown to purplish as they age. Larvae superficially resemble caterpillars but can be distinguished by their appendages. Leaf beetles have three pairs of true jointed legs with no prolegs on the abdomen. Trachymela sloanei larvae are dark green to reddish brown with a black head and prothoracic shield (black area on the top and sides of the first segment behind the head). Larva color resembles the host foliage. There are four immature stages before pupation beneath loose bark, or soil or litter at the base of the host tree. In warm weather, development from egg to adult may be as short as 5 weeks. There are several generations per year from late winter through fall. Trachymela sloanei larvae and adults hide under loose bark during the day and feed primarily at night. Adult beetles and larvae chew semicircular holes or irregular notches along edges of eucalyptus leaves. The beetles can remove most of a leaf?s surface, leaving only the midvein, and they occasionally feed on new terminal growth. Unsightly, tattered leaves are usually just an annoyance that does not appear to threaten eucalyptus survival or health. During heavy infestations, host eucalyptus trees can lose most of their leaves, which increases tree stress. 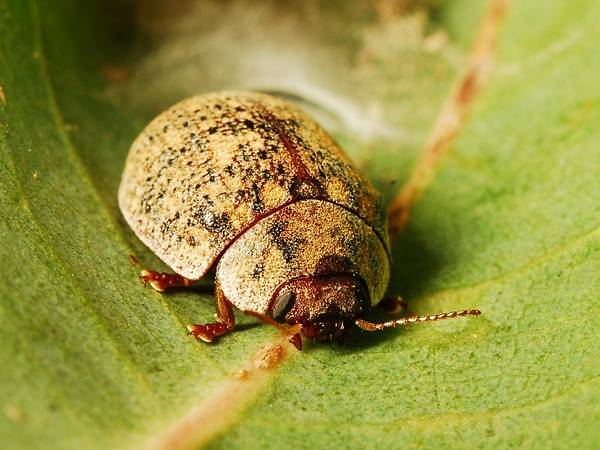 Although these beetles alone are not known to kill trees, their feeding adds to that of more than a dozen other new eucalyptus pests introduced into California during the last three decades. Combined stress from multiple pests, especially if growing conditions or tree care practices are not optimal, could eventually lead to tree death. Pest Notes: Eucalyptus Tortoise Beetle. UC ANR Publication 74104. Produced by UC Statewide IPM Program, University of California, Davis, CA 95616 . Acknowledgements Staff-only pages Subscribe (RSS) Contact UC IPM. Agriculture and Natural Resources, University of California. ? 2014 Regents of the University of California Division of Agriculture and Natural Resources Nondiscrimination Statement. April 25, 2014.